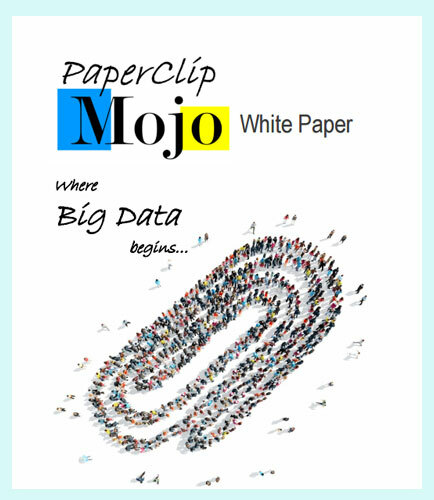 "Where Big Data begin: Paperclip Mojo"
Everybody talks about big data with many uses starting with predictive analytics of this big data. Today’s challenge is the way in which we approach data standardization and how to manage data and engage Crowd Sourcing for Big Data processing. It is very important to find a way to standardize the data, one integration point to exchange with trading partners and open up collaborations with different industries to begin building a true Big Data platform. Leveraging the best use of technology interacting with people can provide an economical service of data capture, data warehousing and predictive analytics. This whitepaper provides insights on the ways to transcribe, translate and interpretation of Big Data faster and more accurate than ever. What’s Inside this Big data Whitepaper?